Last month I presented an unconscious bias workshop to an organisation where the employees are required to wear hi-visibility attire as part of their company dress policy. One of the workshop participants relayed a story to me, which I found compelling in a subtle way. One of the new female employees of the company had had to wait three months for a female version of the company hi-visibility attire. In those initial three months, the employee wore a male version of the attire to make do. When the employee described how frustrating it had been to wait so long, one of her female colleagues mentioned she didn�t know what the �big deal� was. To this response, the employee explicated how uncomfortable she had been during the entire waiting period. The male version was a different cut; hence it did not fit her properly at all and was difficult to get on and off, let alone wear all day everyday. This story highlighted for me the importance of the �lived� experience. Many times we may have an opinion about something, and when we come across someone with a differing opinion we can often be dismissive of them. This is exactly what occurred in the above scenario. As diverse individuals, we each only have our own lived experience, and thus it is vital that we are consistently checking our own assumptions and opinions. Perspective taking is a great practical tool to help with this process of checking our assumptions. 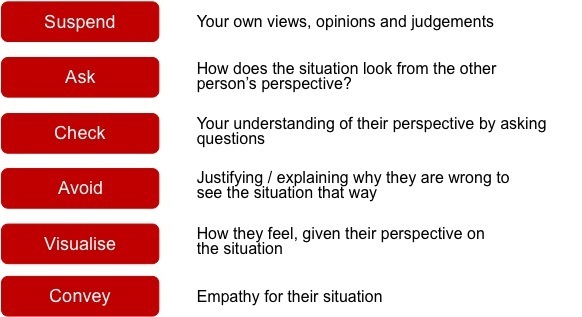 I use the below tool which was created by Professor Binna Kandola (The Value of Difference: Eliminating Bias in Organisations, 2009) in many of my unconscious bias workshops. The key to getting the most out of this activity is to ensure you suspend your own views, opinions and judgements as the initial step. The other steps can be completed in a non-linear method. I highly recommend you test it out with a couple of colleagues over the next week and see how you go. Please do reach out to me directly if you want to discuss the tool in further detail. Newsletter Reader Question: I am leaving Sydney next month for a two-year international assignment in the U.K. I have spent a little time in the U.K., but never for business purposes. How important is my cultural intelligence for this assignment given Australia and the U.K. share many cultural similarities? The U.K. does share many cultural similarities with Australia, but it also has many differences, not least that the U.K. is itself a union of four separate and distinct countries. Many organisations make the common mistake that because we share a common language, a colonial link, and extensive cultural ties doing business in the U.K. is a natural extension of doing business in Australia. It is a little more challenging than these shared connections would indicate. For example, the U.K. is typically more conservative than Australia and prefers a more formal approach. Tradition plays a bigger role in British business; hence change is accepted reluctantly and its implementation can take a longer time. Compared to Australia, class plays a larger role in the U.K. Economic inequality is far greater, although it is often not directly obvious. These differences require a more nuanced cultural understanding and skillset. Another example is the British stiff upper lip. This is a well-known cultural characteristic, but negotiating with it in a business context can often be challenging without everyday familiarity. The British are the masters of understatement and tend to be indirect, subtle and suggestive communicators. Higher levels of cultural knowledge and awareness will allow you to better develop cultural agility and navigate some of the business challenges that do exist in the U.K.
Understanding the impact of British culture on communication styles, business etiquette and personal relationships is an extremely valuable asset in terms of delivering business success on an assignment such as yours. Cross-cultural effectiveness with staff, colleagues and clients in the U.K. will lead to improved collaboration and outcomes, and ultimately an increased capacity to thrive in the expatriate environment. 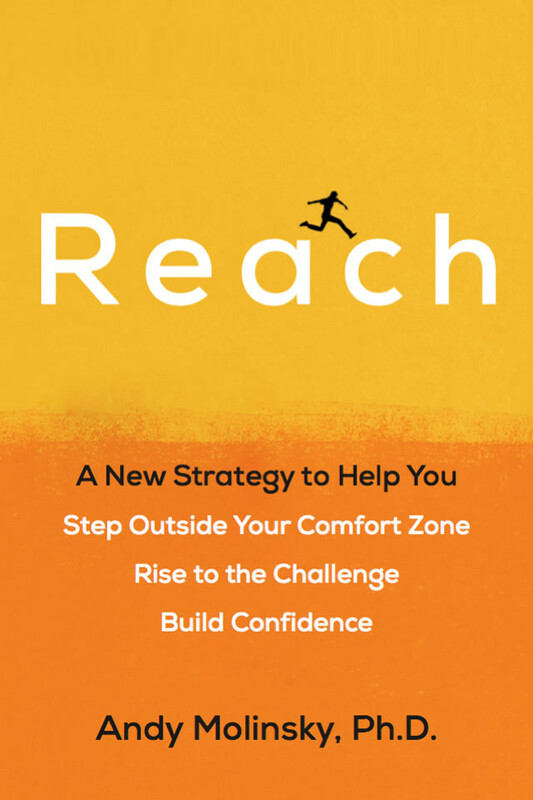 Reach: A New Strategy to Help You Step Outside Your Comfort Zone, Rise to the Challenge and Build Confidence, Andy Molinsky, Ph.D.
Public speaking, networking, delivering bad news, speaking your mind - if any of these things instil a sense of fear or anxiety in you, then you are not alone! It turns out even the most successful people around us share these similar feelings and for most of the same reasons. Yet these successful people have discovered their own way to do them nonetheless. In his book Reach, Andy Molinsky seeks to reveal this way of confronting the things that most of us all too often avoid. Molinsky is an expert on behaviour in the business world and he presents five key challenges underlying our avoidance tendencies: authenticity, competence, resentment, likability, and morality. If you want to challenge your own comfort zone and take on that which you are afraid of, then Molinsky�s narrative quest is certainly worth a read.